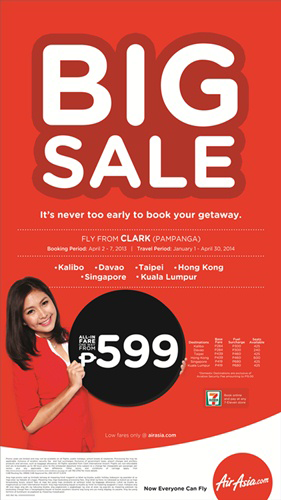 Book your trips for 2014 now and enjoy early bird savings through Philippines’ AirAsia’s big seat sale promo starting today (April 2). Air Asia Philippines All-In Promo Fares from as low as P599 only for international and domestic destinations are available for booking via www.airasia.com from 2 to 7 April 2013, and the travel period will be from 1 January to 30 April 2014. Never miss out on updates about our bargain deals by following Air Asia Philippines via Facebook (facebook/airasiaphilippines) and Twitter (twitter.com/airasiaph).